Communications in healthcare have become a web of information that is difficult to navigate and manage. Beeps from patient monitoring systems, constantly changing on-call schedules, diverse mobile devices, and the rise in care complexity mean more sophisticated communication technology is required to connect the right people with the right information for top-notch patient care. 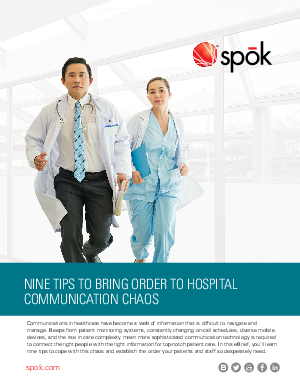 In this eBrief, you’ll learn nine tips to cope with this chaos and establish the order your patients and staff so desperately need.